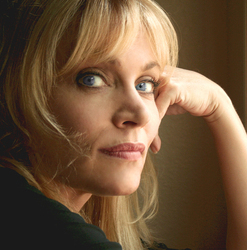 A 2004 trip to the United Kingdom was filmed for the 2005 documentary Daphne Ashbrook in the UK. This DVD documentary followed her work with Doctor Who, including her role as Perfection in the Big Finish Productions audio play The Next Life. She performed opposite Paul McGann for first time since the 1996 telemovie. In 2006, she played Charlotte Howell in the audio drama Dark Shadows: The Book of Temptation for the same company. She has been to the UK twice thus far for Doctor Who convention events. She was featured in extensive interviews on the Doctor Who podcast Doctor Who: DWO Whocast and Doctor Who podcast Doctor Who: Podshock. Additionally, she featured in other podcasts including "The Happiness Patrol". She was notable as being one of only ten actors-and the only woman-to be credited in both the Star Trek and Doctor Who franchises. Though Nana Visitor had a small role on Torchwood: Miracle Day in 2011, both Daphne's roles were 'leads', so she still holds that particular precedent. Her past TV and film work includes Cold Case, CSI, Crossing Jordan, JAG, Murder She Wrote, Judging Amy, acclaimed mini series Intruders with Richard Crenna, Guardian, a recurring role on The O.C. and a lead role in the police drama Family Honor with Ray Liotta and Eli Wallach. Her recent roles include a part in David Ondaatje's 2009 motion picture The Lodger starring Alfred Molina, Shane West, Simon Baker and Hope Davis, and guest starring roles in NCIS reuniting with Charlie Grace star Mark Harmon, The Ghost Whisperer, with Jennifer Love Hewitt, and Without a Trace with Anthony LaPaglia and Steven Weber. She guest starred as a dancer visiting from (the former) Czechoslavakia in the third season of Fame. She is currently (2012) starring in the new Nickelodeon night time soap Hollywood Heights as Chloe Carter (Melissa Ordway) mom, Jackie. In 2010 she released her first music CD, Grace Notes on Dharmapala Records to very positive reviews. The songs range from Roots to Jazz and are mostly covers from some of her favorite singer/songwriters, such as Joni Mitchell and Patty Griffin. The CD was produced by composer/multi-instrumentalist David Vito Gregoli. She has performed music from the CD at various conventions and other events. In 2012 Ashbrook released a memoir Dead Woman Laughing (An actor's take from both sides of the camera). It details her life as an actor and her experience growing up in an acting family. The book has received very good reviews and Ashbrook will be promoting it throughout 2013 at various public appearances including conventions.